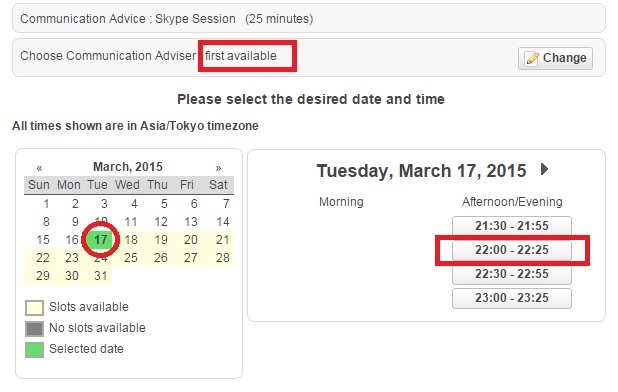 Book an adviser from your available date & time! (Personal session) | weknow by Interstate, Ltd.
Set 「’first available‘ = Choose from calendar」 ! 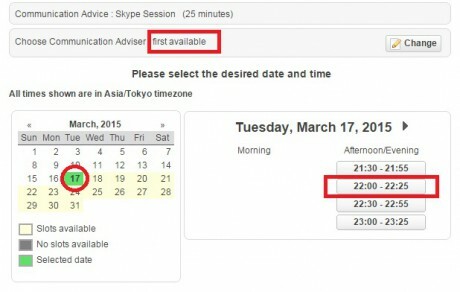 The available adviser will be selected automatically! You can change it if you want. Talk to us in Japan via Skype! Personal session FREE Trial! We accept Ota-ku Gift Coupon (大田区内共通商品券) . Reservation How to use our service! Previous PostPractice bubble sheets for TOEIC Listening & ReadingNext PostSay what you want to say in Japanese!